Both Dan Holman and Jimmy Keohane got hat-tricks on a night that saw Woking sweep aside combined counties outfit, Sutton Common Rovers meaning Woking now progress to the next round of the Surrey Senior Cup. As expected Gary Hill made several changes to the team that was defeated by Kidderminster on the weekend. Jake Cole replaced Nick Hamman, while Kadell Daniel, Jake Caprice and Jimmy Keohane all made their way into the starting 11. From the kick-off it was clear it was going to be an up-hill challenge for Sutton Common Rovers, as Jimmy Keohane scored twice within 20 minutes. A quickly thrown ball from Jake Cole to his right sided midfielder on the night Jake Caprice, caught Sutton open at the back, a pacey cross from Caprice and a fumble from Sutton keeper Leigh Bowden gave Holman a chance to slot home his first of the night. As expected Woking took firm control, they kept vast amounts of possession and another inevitable goal came when Jimmy Keohane got his hat-trick inside 38 minutes, boosting the Cards lead even further. Five minutes before half-time, Dan Holman made a good run and got himself into a position to head a cross, forcing Bowden to save well but Holman was quickest to react and fired a high shot into the net giving Gary Hill and his men a 5-0 lead going into the half-time break. With Woking firmly in the lead, Gary Hill made a straight swap at half-time with the introduction of Godfrey Poku, as Matt Robinson made way. 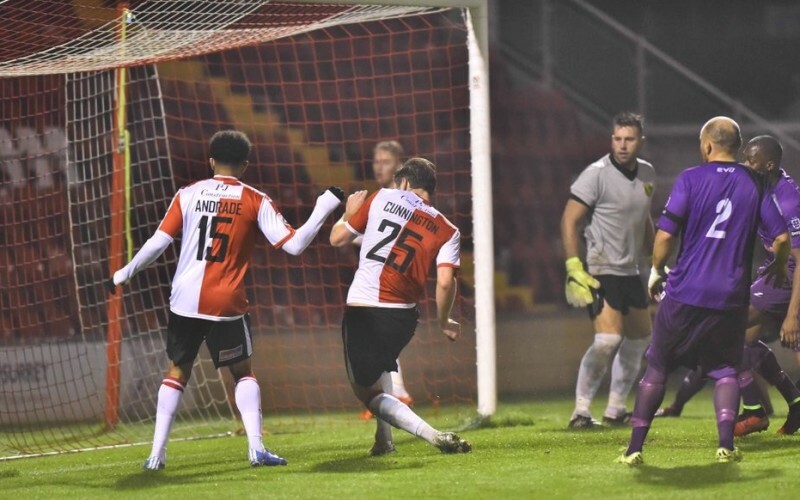 It didn’t take long for Woking to get back to scoring again, as Holman latched onto a through ball and chipped the on-coming goalkeeper with ease. More changes were made from Hill as Bruno Andrade and Giuseppe Sole entered the field of play for the clubs top goal scorers this year John Goddard and Dan Holman. Norwich loanee Cameron Norman impressed throughout the match and continued his fine start in a Woking shirt, beating two men, he crossed low to Cunnington as the Ebbsfleet loanee striker opened his account and scored his first goal for Woking from two yards out. Goals from Andrade and Sole gave Sutton Common Rovers manager Darren Salmon a night to forget, but it was Kadell Daniel who took the pick of the goals on the night, picking the ball up from 25 yards out, he drilled his shot into the corner of the next with an explosive finish. It was a comfortable victory for Gary Hill, but most importantly it was a win. It was Woking’s first win in 4 matches in all competitions, and they will need to keep that momentum going as they have a tough match next Tuesday against an inform Braintree side, who held Woking earlier in the season.